December 19th Program: "Best of Us" Potluck Dinner and Photo Sharing - Don't forget to sign up! This is always one of our favorite programs each year! It's interesting to see where our members have traveled to see birds, whether local or far away. If you would like to share photographs you've taken this year of birds just sign up by emailing Deb Kainauskas, dkainauskas@gmail.com to reserve your spot. If bringing digital, store your photos on a jump drive and we'll set them up. No photos? No problem. Just bring a potluck dish to share with everyone and enjoy the meal and show. Come for a fun, casual evening! December 19th @ 6:30 p.m. for potluck dinner followed by the presentations at Swaim Memorial United Methodist Church, 1620 Naldo Ave., Jacksonville, FL. Camp Chowenwaw Park - Register now! 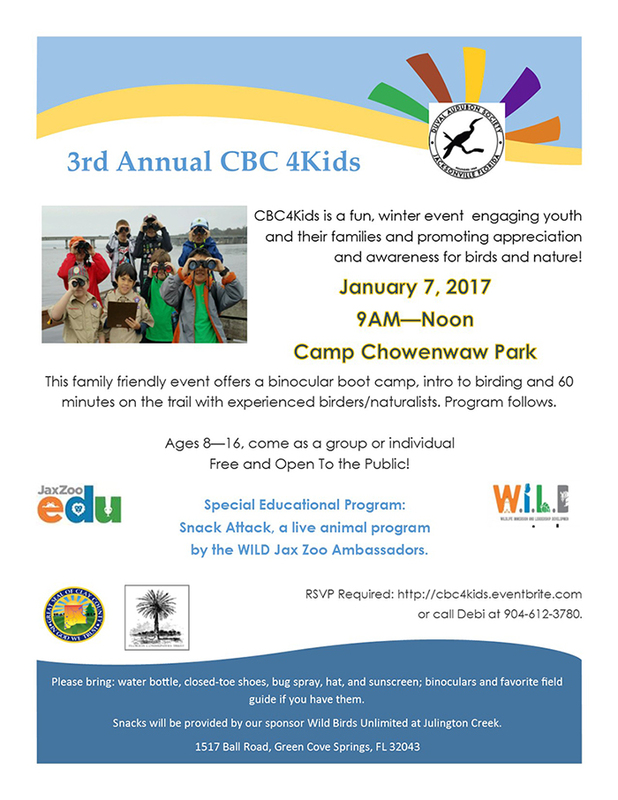 CBC4Kids is a fun, winter event to celebrate birds while engaging youth and their families in real Citizen Science! The successful, annual event is being conducted across North America, promoting appreciation and awareness for birds and nature! This family friendly event offers a binocular boot camp, intro to birding and 90 minutes on the trail with experienced birders/naturalists. A program will follow. Free and open to the public. Ages 8-16. Special Animal Program: Snack Attack, presented by the Jax Zoo Ambassadors, WILD. Please bring: water bottle, closed-toe shoes, bug spray, hat, and sunscreen; binoculars and favorite field guide if you have them. Sponsored by Duval Audubon Society, JaxZoo Wild and Camp Chowenwaw. 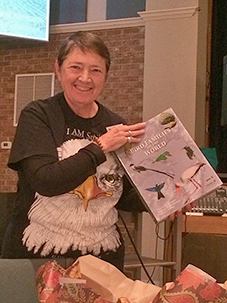 Carole Adams, a longtime board member of Duval Audubon, was recognized at our monthly program meeting on November 21st, 2016 for her dedication and leadership to our chapter and Audubon’s mission. Carole’s ‘spark bird’ was a Northern Cardinal which she recorded at the young age of ten while a Junior Audubon member living in Kansas with her grandparents. Fast forward twenty years and she found herself getting serious about birding and Audubon - so serious that she gave up being a passive member and became education chair of her local Audubon chapter in New York. It didn’t end there, however, and she became a board member and served two terms as chapter president. In June 1996 she received the Meritorious Service Award from the Council of New York State and the National Audubon Society. After taking an early retirement from the New York State Office of Mental Health, she moved to Jacksonville in 1997. Carole says she had no intention of getting actively involved with the local Audubon chapter. She held out for a little over six months! Since that time she has been on the board of Duval Audubon serving in various capacities from Education Chair to President. In addition, she has been a Director on the Audubon of Florida Board. Carole notes that there have been environmental challenges as well as many rewarding experiences during her years with the Duval Audubon Society. In September, 2003 she was presented the Barbara Stephens Award by the Civic Round Table of Jacksonville in recognition of her valuable contributions to the Jacksonville community. In December, 2009 she was the recipient of the Carol and Bob Grimes Environmental Award. November of 2010 garnered a Presidential Recognition by the National Audubon Society Board of Directors for Outstanding Service and Dedication. She was featured in the April 2009 issue of "Water's Edge" magazine and has given countless workshops. Her “Birding 101” was a popular draw as well as her “Owl Prowls”. Her citizen science activities included shorebird monitoring. In May 2009 while conducting a routine shorebird survey at Huguenot Memorial Park with Lesley Royce and Doris Leary, she had the most exciting shorebird experience of her life. It was the discovery and identification of a Greater Sand Plover, an Asian bird that somehow made its way to the beach in Jacksonville. The sighting of this vagrant made only the second western hemisphere record and a first for the state of Florida. Birding doesn't get much more exciting and rewarding than that! The moral of this story is keep birding because you never know what you might see!